Development scale model of Site 250. At the turn of the 21st century Energia complex at Site 250 is falling apart. General view of Site 250 looking south from the Buran landing complex. A 17T113 movable service tower developed at TsKB TM design bureau at Site 250. View from the fueling tower. Command and control area at Site 250A. 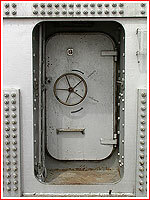 Propellant storage area serving Site 250. 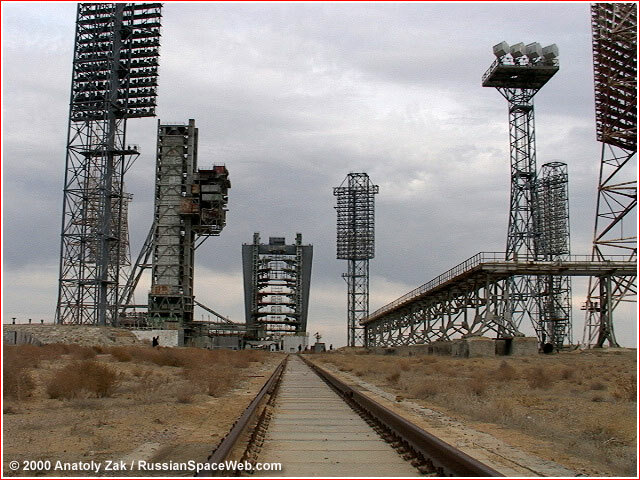 The Baiterek launch complex in Baikonur was designed to host launches of the Angara rocket. Situated on the northern edge of the Baikonur space center, Site 250 as viewed from one of two main railway lines, which were used to roll out the Energia rocket from its assembly building. A legend has it that, when in the wake of the post-Moon Race shake up at NPO Energia, Valentin Glushko took over a position of the Designer General, he put a condition before the Soviet government. A test stand had to be built for a full-scale version of a future heavy-lift vehicle, which would replace the ill-fated N1 rocket. The lack of such facility was widely blamed for the failure of the N-1 booster during four test launches. The Soviet government agreed with Glushko's terms. At the end of the 1970s, a giant test facility for the Energia rocket, which could also serve as the launch pad for the vehicle was founded at Site 250. 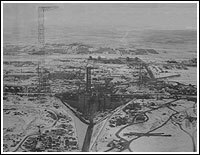 Known as UKSS, from Russian abbreviation "Versatile Stand/Start," the pad became the biggest launch structure in Baikonur. It was set up at the edge of the giant artificial flame trench 40 meters deep. Unlike regular launch pad, the complex was designed to withstand the pressure of the engines with the total trust of 4,000 tons burning for dozens of seconds as the rocket remains attached to the pad during the test. A movable service tower equipped with cargo and passenger elevators and a crane, allowed access to the rocket in vertical position on the launch pad. UKSS command complex controlling pre-launch processing, fueling and the engine firing was located three kilometers from the pad at Site 250A. The facility was protected for a possible on-pad explosion. A special propellant storage complex (see photos below) is built several kilometers from the pad to support testing or launch. This complex can hold 3,60o tons of hydrogen, 3,600 tons of oxygen, 1,200 tons of kerosene and 3,000 tons of nitrogen. During a live test firing, the Energia rocket was consuming around 11 tons of propellant every second! May 15, 1987, 21:30 Moscow Time: The first Energia super booster (Number 6SL) was launched from Site-251 in Baikonur carrying a Polyus military payload. The rocket performed flawlessly, however, Polyus orbital maneuvering system fired in the opposite direction due to the control system problem causing the payload to fall in the ocean. In the first post-Soviet decade, all Russian activities in Baikonur were limited to attempts to preserve or upgrade infrastructure for existing rockets. However by 2002, Moscow-based KBOM bureau, which originally designed launch facilities for Proton and Energia, began studying options for bringing the next-generation Angara rocket, then in the development at Khrunichev enterprise, to Baikonur. The launch complex would be designed to handle the Angara rocket equipped with the Briz-M upper stage, as well as with the KVRB cryogenic upper stage. (363) By 2003, the concept had become a subject of discussions of the Kazakh-Russian inter-government commission on cooperation led by Russian vice-prime-minister Victor Khristenko and his Kazakh counterpart Saut Mynbaev. A formal agreement paving the way to the construction of a launch complex for the the Angara-A5R rocket in Baikonur was signed by Russia and Kazakhstan in Astana on Jan. 9, 2004. The same document also extended Russian rent of the Baikonur facility from Kazakhstan to 2050. Another agreement detailing the project of the launch complex dubbed Baiterek (Holy Tree) was signed on December 22, 2004. Altough Angara-A5 was considered a main candidate for deployment in Baikonur, the Baiterek complex could also host lighter versions of the rocket. During 2004, Khrunichev issued a pre-preliminary design of the Baiterek complex and after its approval by Kazakhstan developed a preliminary design. According to the original proposal, the new facility would be built in place of Pad No. 40 (SK8P882K-4F) at Site 200, which previously hosted the Proton rocket and stayed abandoned and decrepit at the turn of the 21st century. The actual design of the complex was expected to be as similar as possible to the original launch complex of the Angara rocket in Plesetsk. For the pre-launch processing of the Angara rocket, Khrunichev planned to use Hall 111 inside Facility 92-50 on the left flank of Baikonur. A ceremonial marker, commemorating the foundation of the Baiterek complex was installed at Pad No. 40, however for years, little else was going on at the site. In the meantime, an alternative plan calling for the construction of the Baiterek complex at Site 250 has emerged. In June 2005, the representative of the Khrunichev enterprise said that Kazakh funding for the construction of the launch complex for the Angara rocket had already started. At the time, the construction of the complex was expected to take from five to six years. The system would eventually replace Proton, which was expected to fly until 2010-2015. According to unofficial reports, in November 2006, representatives of Khrunichev enterprise and Kazakh officials were planning to conduct surveillance of a new flight path for the Angara-A5 launcher from Baikonur, which would enable it to reach orbits with inclination 48 degrees toward the Equator. Such trajectory would be almost ideal in terms of delivering maximum cargo possible from Baikonur. This flight path was avoided in the previous half a century of Baikonur's existence, since it would take the rocket over the Chinese territory. It was unclear, if this political issue was resolved in case of the Baiterek project. During his visit to Baikonur in May 2007, head of the Russian space agency, Roskosmos, Anatoly Perminov told reporters that Khrunichev enterprise was directed to complete a general draft-schedule of the Baiterek complex development and to start its implementation in the second quarter of 2008. On April 18, 2008, key contractors in the development of the Baiterek complex, including Khrunichev met with local community leaders and other officials in Kzyl Orda, a regional center near Baikonur Cosmodrome, Kazakhstan Today news agency reported. Two sides discussed projected environmental impact of the Baiterek facility on the surrounding area and on drop zones downrange from the launch site. Space officials assured local representatives that replacement of the Proton rocket with the Angara launcher would improve ecological situation in the region. They also promised to keep all development work at the site transparent to the general public. The head of the Baiterek joint venture, Aleksandr Taryanik, confirmed that the "real implementation" of the Baiterek project would start in 2008. At the time, the cost of the Baiterek complex development was estimated at eight billion Kazakh tenge or 1.72 billion rubles during 2009-2011. In the meantime, by 2009, the idea of construction of a dedicated processing building to support Baiterek operations at Site 250 was apparently under consideration as well. As it transpired, as early as 2007, Kazakh representatives questioned wisdom of developing Baiterek on the basis of Pad 40 at Site 200, right in the vicinity of Pad 39, hosting the Proton rocket. On Oct. 24, 2008, Ivan Akhmetov, director of the Baiterek joint venture said that Site 250 was chosen for the future launch pad of the Angara rocket. On Sept. 24, 2009, during the meeting of the Russian-Kazakh intergovernmental commission on Baikonur, the head of Kazakh space agency Talgat Mysabaev confirmed earlier reports that a decision was made to conduct the development of the Baiterek complex at Site 250, instead of Site 200. An option of placing Baiterek at Site 110 was apparently also on the table. Musabaev promised that Kazakhstan would begin the actual construction of the Baiterek complex in 2010. In the meantime, Gennady Kleimenov, chief designer of the Angara rocket, told Izvestiya newspaper that due to the move of the Baiterek complex from Site 200 to Site 250, the first launch of the vehicle from Baikonur would have to be postponed from 2012 to 2014. Kleimenov promised a formal defense of the new revision of the preliminary design for Baiterek complex in the first quarter of 2010. By the end of the first decade of the 21st century, Baiterek was the only project aiming to bring a next-generation launch system to Baikonur. If the 2007 decision of the Russian government to move manned launches from Baikonur to Vostochny would materialize, the Angara could become a lone vehicle flying from Baikonur in 2020s. The first stage of the Angara-5 rocket flying from Baikonur was expected to impact in Semei region, near towns of Abai and Ayagoz in the Eastern part of Kazakhstan. According to Kazakh media, authorities in Astana planned to consider the matter on Jan. 13, 2011. (448) At the time, the inauguration of Baiterek was pushed back to 2015. However on Sept. 19, 2011, head of the National Space Agency, Talgat Musabaev, reported to the Mazhilis (parliament) that the construction of the complex would be conducted from 2013 to 2017. According to Musabaev, technical and economic feasibility studies on Baiterek had been submitted to the Ministry of Economic Development and Trade for expert assessment. (518) A month later, Musabaev told the Kazakh parliament, that for the past two years, his agency had been negotiating with Russia an addendum to the 2004 agreement on Baiterek, which would include deadlines, the final cost and exact responsibilities of the Russian side on the development of the complex. According to Musabaev, since the original agreement, the cost of the program had increased from $223 million to $1.248 billion, requiring a new decision on the project at the high political level before the actual construction could begin. The new agreement would reduce economic and political risk for Kazakhstan, however the Russian side resisted its conditions, Musabaev said. As late as March 2012, two sides were still blaming each other for the lack of progress in the development of the Baiterek complex. Kazakh officials demanded a confirmation from Russia that Angara pad in Baikonur would not duplicated in Vostochny, while Russian officials linked their latest plans to bring the future rocket to the far-eastern site by the lack of funding for Baiterek. At the time, Russian officials estimated a full cost of the program at $1.6 billion, while promising to cut cost of the facility by the deferring the construction of unessential infrastructure, such as on-site propellant storage. On Dec. 5, 2012, the head of the Kazakh space agency, Kazkosmos, Talgat Musabaev told the Interfax new agency that his country had dropped plans to bring the Angara rocket to Baikonur under the Baiterek project due to its escalating cost and the refusal of Russia to participate in its funding. Russian plans to build a launch pad for the Angara rocket in Vostochny Cosmodrome on its own territory further undermined the economic feasibility of the Baiterek venture. According to Musabaev, Kazakh officials were conducting serious negotiations to form a new joint venture with Russia around a launch vehicle other than Angara, such as Zenit. 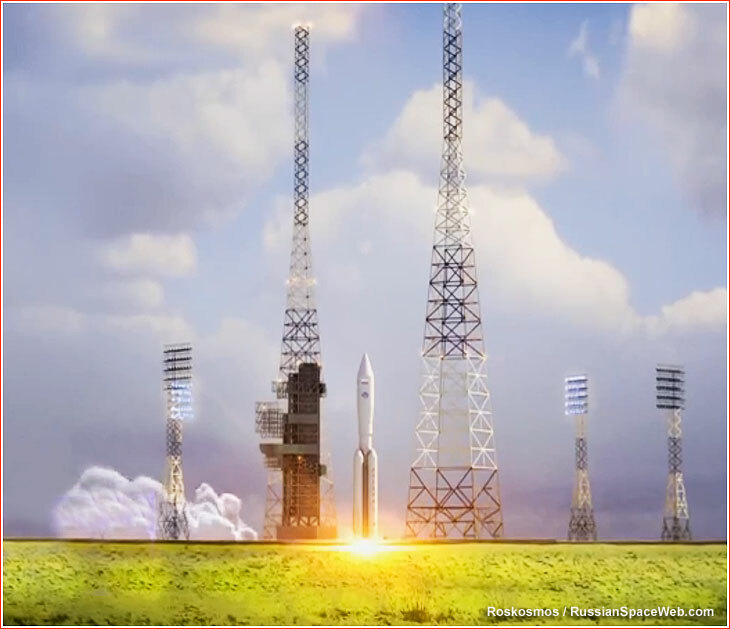 Built in Ukraine, the Zenit rocket already had an operational launch pad in Baikonur, while a Russian firm RKK Energia recently publicized plans to develop a Sodruzhestvo (Alliance) heavy-lifting launch vehicle from components of the Zenit rocket. 2003: Kazakh-Russian inter-government commission on cooperation led by Russian vice-prime-minister Victor Khristenko and his Kazakh counterpart Saut Mynbaev discuss a scheme to bring Angara to Baikonur. 2004 Jan. 9: In Astana, Presidents of Russia and Kazakhstan sign an "Agreement between Russian Federation and Republic of Kazakhstan on development of cooperation for effective use of Baikonur Cosmodrome." Article 4 of the agreement calls for joint development of the Baiterek complex, Article 6 extends Russian rent of Baikonur until 2050. 2004 Dec. 22: Kazakh Prime Minister Danial Akhmetov and Russian Prime Minister Mikhail Fradkov sign an inter-government agreement on the development of the Baiterek complex. 2005 Sept. 28 - Oct. 11: Kazakh parliament ratifies the agreement on the Baiterek development. 2008 April 18: Key contractors in the development of the Baiterek complex, including Khrunichev, met with local community leaders and other officials in Kzyl Orda, a regional center near Baikonur Cosmodrome. 2008 Sept. 17: A survey committee on the development of the Baiterek complex conducts its second meeting in Baikonur chaired by a director of the Baikonur federal space center Dmitry Chistyakov. Four sub-committees are formed, tasked with assessing technical condition of existing infrastructure and determining future upgrades and reconstruction work. 2008 Dec. 5: Directors' Council of the AO SP Baiterek stock-holding company held a meeting. I. I. Akhmatov, Director General of the AO Baiterek reported on the planned completion of technical documentation on the launch complex during 2009. 2012 Dec. 5: the head of the Kazakh space agency, Kazkosmos, Talgat Musabaev told the Interfax new agency that his country had dropped the plans to bring the Angara rocket to Baikonur under the Baiterek project.